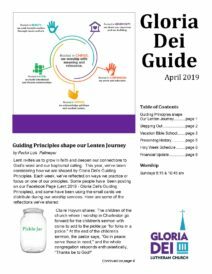 The monthly Gloria Dei Guide offers a deeper exploration of our ministries. The Guide is published on the first of the month (except July). When it is published, a link to each guide is emailed to subscribers of the weekly e-News emails. Sign up to receive weekly e-mails about activities and events at Gloria Dei. Sandra Brick translates Fred Amram’s stories about his early life in Nazi Germany and then as a refugee in the USA into powerful visual art. For more information, visit Sandra’s website.